Doesn't this look festive? Your guests will be impressed by your ingenuity (and less bowls to wash). My pal, Laura, mentioned that she loved the idea of serving soup in a pumpkin so I decided to try it. First, I had to find small pumpkins that were edible. No problem. In the produce department of my local Stop & Shop there are “Sugar Pie” pumpkins for $2 each. You do not need to make the pumpkin bowls if you don’t want to. The soup is packed with 606% of your daily value of vitamin A, 13% of your daily value of iron, and 101% of your daily value of vitamin C. That is before you start eating the pumpkin! The pumpkin bowls are a bit of a pain. Leave plenty of time for cleaning the out and wear something washable because you WILL be covered with pumpkin goop. When you eat this, scoop out some of the pumpkin flesh as you spoon out your soup. It makes this lovely chunky, sweet, and filling dish. I didn't add the calories of the pumpkin to my nutritional analysis because I am not sure how much you will eat. I wouldn't worry about consuming too much squash, though. Have you ever made soup in pumpkin bowls? Preheat the oven to 400 F. Using paring knife, cut a large circle around the stem of each pumpkin. Remove the lid and scoop out the seeds and fibers. Sprinkle the inside of each pumpkin with ½ teaspoon sugar and salt. Roast for 20-35 minutes (depending on the size of the pumpkin) until tender. While the pumpkin bowls are roasting, melt butter in large saucepan over medium heat. Add onion and thyme and cook about 3 minutes until onion is soft. Add the squash and the sugar and cook for five minutes until glazed, stirring often. Add five cups of water and bring to a boil. Reduce the heat to low and simmer, uncovered, until the squash is tender (about 15 minutes). Puree soup in blender in small batches. Fill the blender about ½ full or you may have a big mess on your hands. Taste and adjust seasonings. Ladle hot soup into hot bowls and garnish with croutons, pumpkin seeds, bacon, a dollop of yogurt, parsley, or anything you like to add. How much soup is in a serving - 1.5, 1.25 cups? It is a lovely presentation, but looks like a lot of work! But it does feel like something you want to try at least once. So fun! Sounds nice as an appetizer on Thansgiving or even to accompany those left over Turkey sandwiches. How far in advance can I make the soup? Reheating sounds more manageable with all the other kitchen acrivities happening on Thansgiving! Sorry I got carried away sharing-I love this time of year! Thank you Lisa for the tutorial on Butternut prep-I've been doing it the hard way for years and one is staring at me right now that I've put off roasting because of that darned chopping prep. This soup looks great but I find that a hand blender works so much more easily for pureeing soup - rather than doing the messy work of transferring to blender in batches. I just have a cheap one from Target and it works great! Thanks for the recipe! 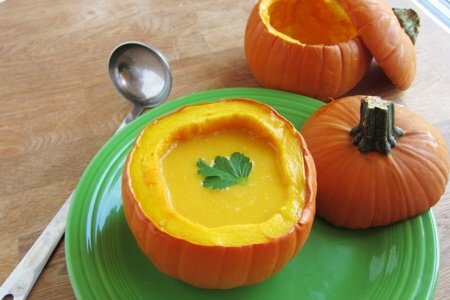 I'll try it soon but with out the pumpkin bowls though they are really cute! @Beth - A serving is 2 cups. I have fixed the recipe to reflect that. Thanks for the question! @Megan - I think you could make this three days in advance. It would be GREAT with turkey sandwiches. Thanks for the question! Use a bag of frozen butternut squash - it's already peeled and cubed, and you just poured into the pot. Sometimes frozen vegetables are cheaper and more nutritious than fresh because of the way they are stored. I make similar soups with a bag of frozen peas,pea soup, broccoli for broccoli soup, or a medley of carrots, broccoli and cauliflower, very nutritious and Low calories.